These sugary lovelies are so addictive. You know what? 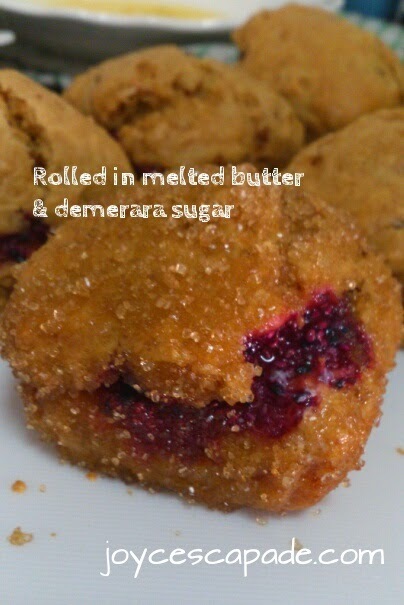 They are rolled in butter and sugar. Brilliant recipe by Nigella. 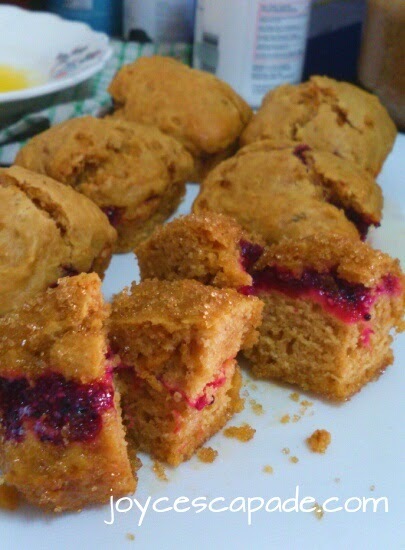 If you put aside calories for once, these muffins are heaven-sent. I kid you not. Anyway, in the end, I only roll one muffin in butter and sugar. I keep the rest naked and they all taste just as good. Anyway, back to these muffins. Recipe is adapted from the suggested link here. 1. Preheat oven to 190°C. Grease a 6-square-hole normal-sized muffin pan generously with oil. 2. In a bowl, beat together milk, oil, egg, and vanilla extract with a fork. In another bowl, sift flour, baking powder, and salt. Whisk in sugar until combined. Fold the wet ingredients gently into the flour mixture until just combined. 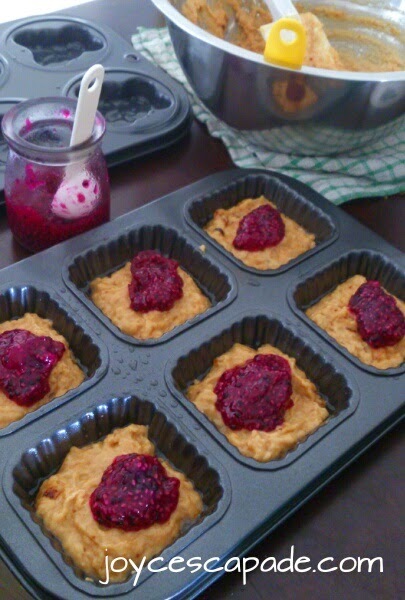 Do not over-mix or you will get tough muffins. 3. 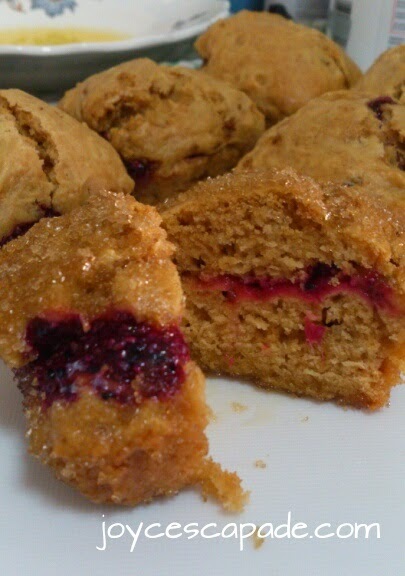 Put a spoonful of mixture into each muffin cup until 1/3 full. Then, add a teaspoonful of jam, followed by another spoonful of mixture. 4. 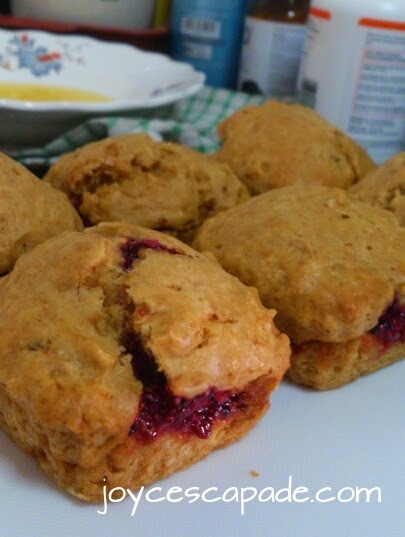 Bake for about 20 minutes until the muffins are gloriously risen and the tops feel springy to touch. Let cool before unmoulding. 5. 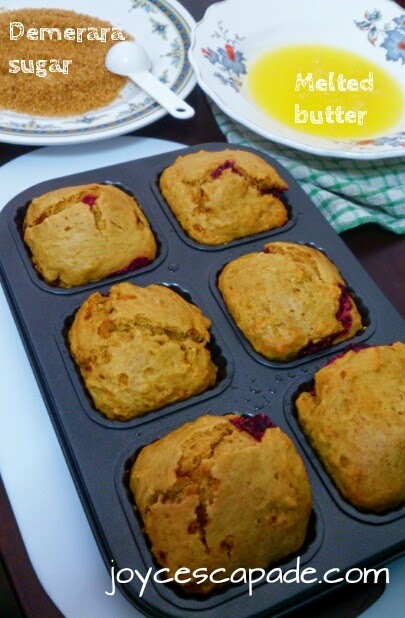 Roll the muffins in melted butter and sugar. Serve. Adding a dollop of jam to each hole. Ready to be rolled in butter and sugar! Unmoulded from the muffin pan after cooled down. I roll one muffin in butter and sugar. Cut into bite-sized pieces before eating. 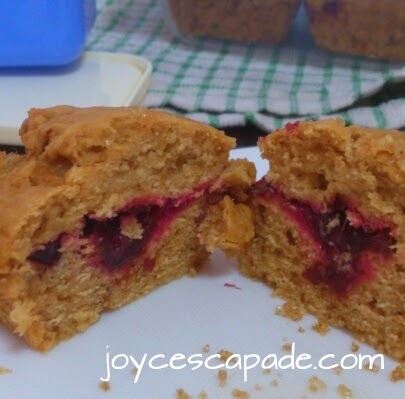 I'm linking this post to the event, Bake-Along #71: Theme - Jam Doughnut Muffins organized by Joyce from Kitchen Flavours, Lena from Frozen Wings, and Zoe from Bake for Happy Kids. hi joyce, thx for making these doughnut muffins to bake along with us! they are indeed quite addictive. We have tried 2 or 3 times the crust recipe from williams sonoma during our bake along event and they are quite easy to manage, so is the crust recipe for the maple pecan pies. Have a wonderful weekend! 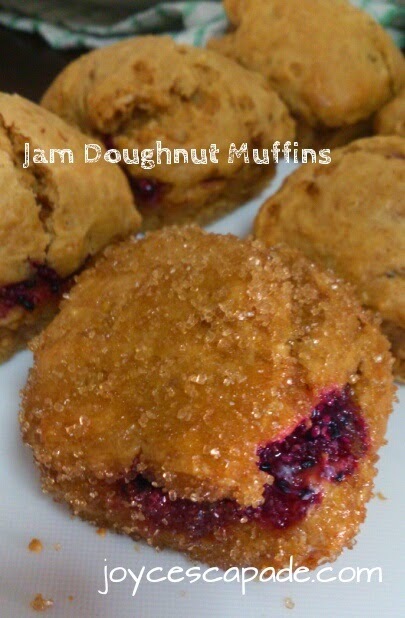 Your doughnut muffins sounds good with your homemade jam! We enjoyed eating these delightful muffins!